This blood splatter set has taken sometime to get together. 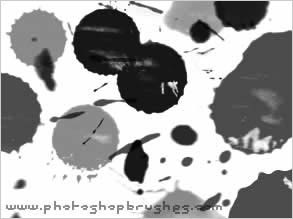 Quite a good selection of thirteen splatter photoshop brushes, these vary in size, some quite large and some small. Check out the Grunge Brushes page for more dirty grunge style brushes. If you are looking for more splatter, stain styled PS brushes, check out the new set of eighteen Coffee Stain photoshop brushes, a brand new very large set of splats and stains, great textures.